The Finns live in the Republic of Karelia, Leningradskaya Oblast, St.Petersburg. The Finns are the titular nation of Finland, that was controlled by Russia from 1809 to 1919. The Finns can be subdivided into western Finns (or simply Finns) and eastern Finns (or Karelians). For more info on Karelians, see separate entry. Diaspora: USA, Sweden, Canada, Norway, Estonia, Ukraine, Kazakhstan. The first permanent settlements in what is today Finland, appeared around 100 A.D. when migrating tribes crossed over from the south side of the Gulf of Finland. They were part of the Finno-Ugrian peoples that probably had originated in Central Asia and eventually evolved into such groups as the Finns, Estonians, Magyars, Mordvinians and Lapps. Although there were early contacts between the Finns and the Russians of Novgorod, the Finns over the centuries developed an orientation to the west and north, as trading connections with the Swedes grew stronger and stronger, while the connections with the Slavs in the east did not develop in the same way. Gradually, the Swedes established control over the Finns. Christianity was brought to the Finns in the 13th c. by Roman Catholic missionaries protected by Swedish military. In the 16th c., when Lutheranism swept through Sweden and replaced Roman Catholisism, Swedish missionaries carried the new religion to Finland as well. Around 1710, tsar Peter the Great of Russia decided to take control of Finland as a way of giving Russia an outlet on the Baltic Sea. By 1716, he had gained his opening on the Baltic Sea. The struggle for control over the rest of Finland raged on and off throughout the 18th c. At the conclusion of the Russo-Swedish war in 1809, all of Finland was ceded to Russia. Finnish nationalism had been increasing already under the Swedish rule, but grew strongly under the Russians as a natural reaction to the strong russification policies of the Russians. Finns were drafted into the Russian army and attempts were made to replace Finnish with Russian language, and Lutheran faith with Russian Orthodoxy. The power of the Finnish legislature was practically eliminated in 1899, and within a few years, Finland was ruled in a totally dictatorial manner. It was during the century under Russian rule that the Finns finally evolved into two distinct ethnic communities. 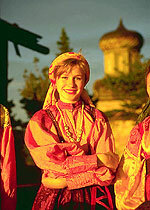 The Finns living in Karelia had been heavily influenced by Russian culture for several centuries, and also adopted the Russian Orthodox religion instead of Lutheranism. Karelia was annexed by Russia in 1721, and remained under Russia also after the World Wars. When the Soviets withdrew from World War I in the wake of the 1917 revolution, Finland declared itself independent with full support of the Allied Powers. When the Soviet Union went to war and invaded Finland in 1939, Finns and Karelians resisted the aggression. After several months of heroic fighting, they gave in in March 1940. Finland had to cede appr. 10% of its territory to the Russians, including the Karelian isthmus and the Finnish shore of Lake Ladoga, bringing more Finns under Russian rule. During the 20th c., substantial numbers of the Finns in Russia, mainly around St. Petersburg, have assimilated into the larger Russian society. Ever since World War II, there has also been an emigration of Finns (and Karelians) to Finland. With the break-up of the Soviet Union in 1991, and the ensuing economic collapse, Finland prepared for large-scale immigration from Russia.